"Tiny House, Big Flavor" is a series featuring recipes and cooking tips for van lifers, minimalists, and foodies. Created by Laysea Hughes. Cooking seems to be the biggest question I receive about living in a van. 'I mean, you can’t possibly be cooking proper meals in your van, right?' Sure there are those travelers who eat only ramen cooked on jet boil and chips and salsa for snacks. And maybe that’s okay for them. But for my boyfriend and I, food is about loving both the ingredients and the flavor. Living in a tiny home demands efficiency. From the way you fold and stow your clothing to the way you and your partner move about the house. Cooking is no different. This blog will show examples of how we cook delicious, efficient meals focused on fresh and healthy ingredients; no refrigerator required. The first recipe is our favorite flavor that can be added to create any meal, or eaten alone as a rich snack. For this recipe (and, well, all of my recipes) portions for each should be the cooks decision based on your particular palette. Personally, I LOVE garlic for both its flavor and its nutritional properties including antioxidants, ability to lower blood pressure + detox the body, and not to mention garlic keeps the vampires away. For this reason I always start with several cloves of raw garlic. A hand full of fresh basil is next. This will provide a lot of the body of the pesto, so make sure you have plenty and add the flavor ingredients to taste. Traditional pesto includes pine nuts but I prefer a handful of salted pistachios. Hold the cheese if you’re vegan, however i use a generous portion of Parmesan cheese (keeping it cool in a fridge or cooler is nice for the taste, but not entirely necessary if it’s not available to you). Oil of choice to mix, I typically use olive oil, or avocado oil. 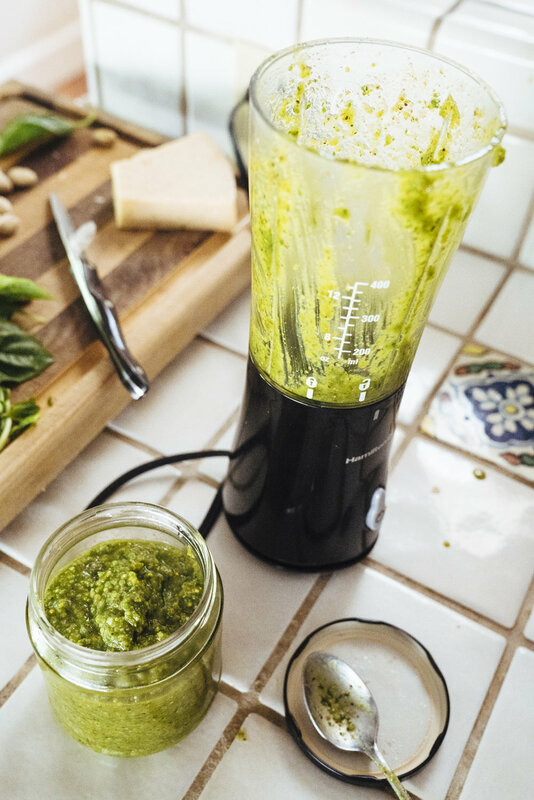 Combine all ingredients in a blender and mix thoroughly, I prefer my pesto left slightly chunky. I use a small blender that pulls only a small amount of power from our van battery (or in this particular case, my boyfriend's parents house). A good kitchen needs tools. If you don’t have a solar battery or access to shore power, the mortar and pestle method works well also. I always have a jar of this in the fridge ready for dipping crackers for an appetizer. Another favorite is a salad dressing. 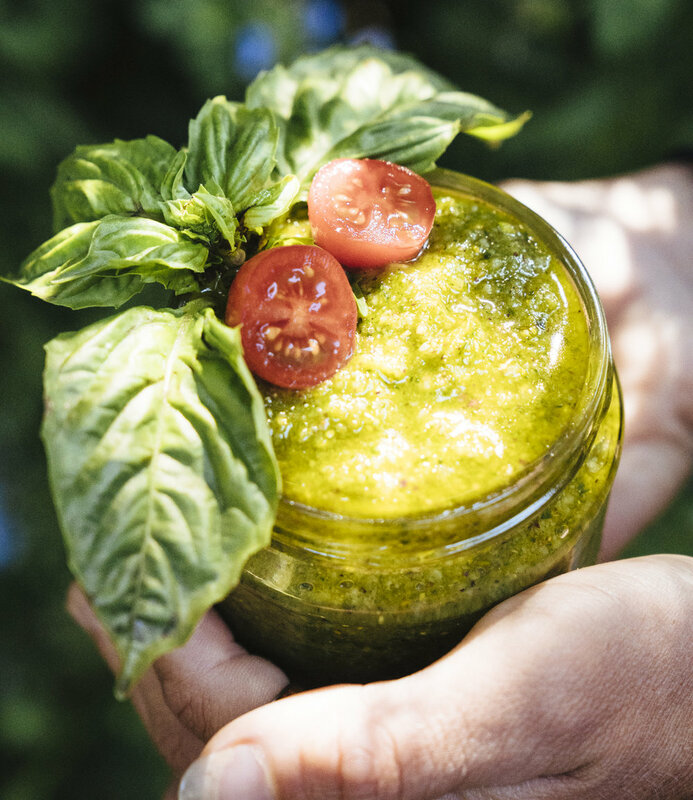 A spoon full of pesto, a little extra oil and balsamic mixed together for a perfect dressing. 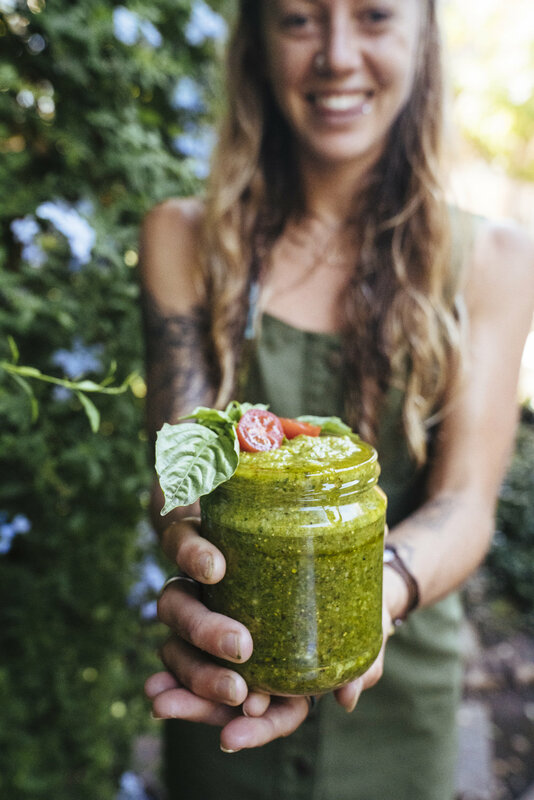 For an entree option, I love to use pesto as the base for a sauce added to any starch (couscous, gluten free pasta, or rice) to enhance any traditional side dish. Enjoy! Laysea is photographer, yogi, and wild child living in her '83 VW Van with her loyal dog, Koda, and boyfriend, Michael.